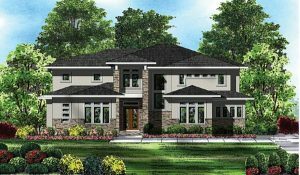 Each year the Home Builders Association of Raleigh of Wake County presents The Triangle Parade of Homes, the largest open house of NEW homes in the Triangle built specifically for the Parade. The Triangle Parade of Homes attracts a wide audience from design idea hunters to mild house hunters to the serious new home buyers. More than 250 homes will be on display, some decorated, and all to showcase great ideas and the hottest design trends. The Parade of Homes is a free, self-guided tour open to the public and runs September 30 – October 1, October 6-8 and 13-15 from 12 p.m. -5 p.m. This annual tour is the best way to view the latest homes and the newest communities throughout the Triangle. Grayson Homes is pleased to announce an entry for this year’s Parade of Homes Tour. 701 Cranbrook Rd, Raleigh is under construction and will be ready for the starting weekend. This home is located in the Chestnut Hills area of North Raleigh and features 3,962 heated square feet, 4 bedrooms, 4.5 bathrooms, and priced at $1,039,200. From I-440, north on Six Forks. Left on Cranbrook Road. Home is on the left.